Kefalonia restaurants are found in all tourist places and beaches around the island. Depending on the location, they vary in style but the majority of Kefalonia restaurants are family places with traditional food. Lassi, Lourdas, Xi, Argostoli, Skala and Agia Efimia are places with many traditional restaurants in Kefalonia. The cosmopolitan port of Fiscardo, on the northern side of the island, focuses more on fish taverns and upscale places to eat. While dining in Kefalonia, do not miss the chance to try local dishes. The traditional meat pie is very popular as well as dishes like kleftiko and beef in red sauce. As Kefalonia is famous as a wine-producing island, taste the delicious house wine and the local Robola wine variety. Here are some lovely restaurants in Kefalonia. Each restaurant is presented with detailed text, photos and point on Google map. If you have visited any of these restaurants, feel free to write your review. All request forms go directly to the restaurant manager so that you can make a reservation in person or ask them any question. Elli's Cafe - Restaurant is located on the seafront of Fiskardo, with a view to Ulysses island (Ithaca) and the wonderful blue color of the Ionian Sea. You may enjoy our delicious meat and seafood dishes, accompanied by a variety of traditional wines. Andromeda is a lovely Greek restaurant located close to Lourdas Bay, on the southern side of Kefalonia. The restaurant is located off the main road to Skala and is quite easy to find. Family run restaurant, serving traditional Greek dishes. The vast majority of our dishes are cooked with our own organic ingredients, such as vegetables, meats, olive oil and feta cheese. The bread is made daily on premises. We are looking forward to meeting you. Ampelaki is a charming restaurant located at the end of the beautiful harbor of Argostoli. The restaurant is located near the ferry terminus and is housed in a lovely flat building with great decoration. Blue Sky is a recently opened (2011) restaurant in Lassi. It has a large and excellent menu with a wide range of Greek dishes to choose from. Mention John and Julie to get 10% discount (for 2011 only). Captain Jerry Fish Taverna serves the most amazing recipes with fresh fish and seafood, grilled or fried. 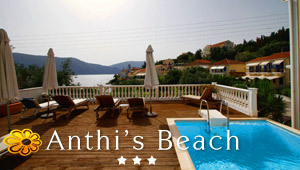 With authentic Greek recipes, this restaurant with great sea view gives you unforgettable memories from Kefalonia. Dionysus tavern is a lovely eating spot located in Lourdas, a beautiful coastal area in Kefalonia. This Greek restaurant is surrounded by a picturesque setting and lovely atmosphere. Located above the beach of Petani, 14 km from lixouri, Xouras tavern offer breakfast, lunch and dinner. Enjoy the fish grilled meals, the homemade dishes and the great service. The environment is beautiful and offers nice view to the sea and the sunset. Old Times restaurant is located in Skala, a picturesque village in midst of serene and beautiful settings. This lovely restaurant offers its guest spectacular view of the sea and the gentle sound of the waves. Large choice of traditional Greek food, cosmopolitan specialties, soups, grilled meats and fish. Home made desserts and ice creams, house wines from the barrel and wide selection of plain and liqueur coffees. Children's Menu and Vegetarian Menu.